After such a cold week, with so much sleet and ice – the ground looks like it is coated with snow. Well why not celebrate having a “white” December in Texas. Here is Snowy Field, an oil pastel (7×5) painted on Mi-Teintes Pastel Paper – cream tint using mostly Senneliers, Holbeins and a few Neopastels. I used a clay shaper to spread the oil pastels today, since it is so cold out – this helps a lot. I’m still not satisfied that my scenes illustrate volumes of snow and snow banks, so tomorrow I will try again. I’m working my values, but it may be that the majority of my colors are the same value and that is problem the crux of my problem is getting the volume to show. I’ll take a B&W photograph of this painting and see if that reveals something to me. Hope you are enjoying your day . . . 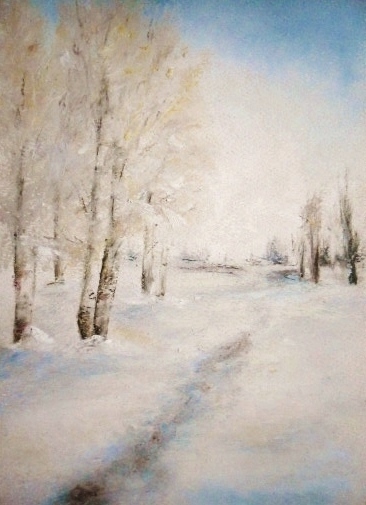 This entry was posted in About Oil Pastels, OPs New Paintings and tagged oil pastels, painting, pathway, snow, trees. Bookmark the permalink. Hi Mona, thanks! I hope you do because you, the talented one, would nail it on your first painting – go for it over the holidays. You’ll have lots of fun! So great! You have captured the typical “wintercolors” in a great way. 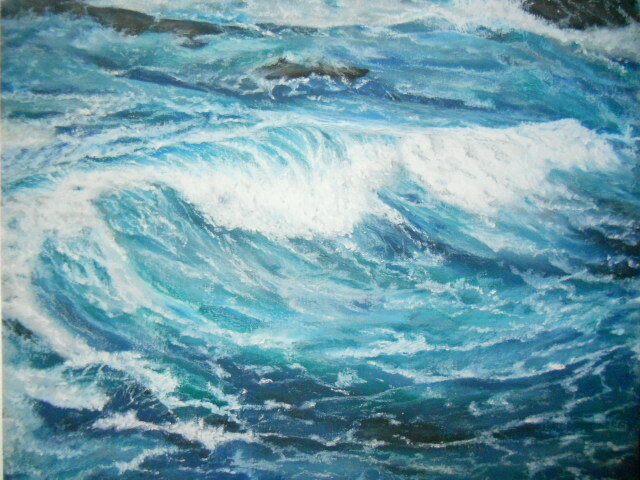 Wonderful painting! Thanks Kerlund74 I really appreciate your nice comments! I like the bit of blue sky. Lol, thanks so much and glad you can enjoy this little snowscape! First snows are like that sometimes – not knee deep. Your painting is simply beautiful and is so close to reality that I hope no humans will leave footprints. Thank you Dorann, you are most kind – these barren landscapes remind me of winters in Maine where few people ventured out into the fields. Painting snow is a passion of learning for me, of winter white colors and of various types (ruddy, smooth first snow, and heavy deep) – one day I’ll have these down. December has been devoted to snow paintings (a few other interesting subjects thrown in here and there), because after that snow won’t be revisited until next Fall. (I’m trying to hurry winter along, lol). Thanks Marina so much. I miss snow to see it’s glistening beauty – that is unsurpassed, but living by the shore had an icy cold that my bones will never forget. Brrrr I feel cold watching it and very warm from the quality. Is it a contradiction to feel both? no not really. Mary can do it! Not a contradiction at all Doron with snow – sometimes it has the warmth of sun’s glow and the cold of winter’s grip. Love reading your comment, thanks! Thank you very much Uncle Tree for your wonderful comments. Happy holidays to you as well and thank you for stopping by! Thank you very much for the award, much appreciated!